The Guia Fortress was built between 1622 and 1638 on the highest hill in Macau. 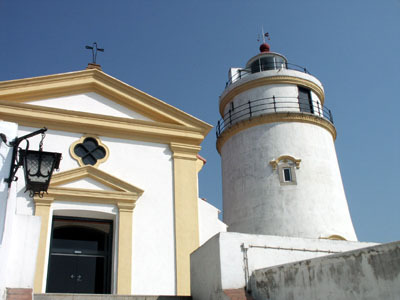 The lighthouse came later, in 1864-1865, but the chapel dates back to the founding of the fort. 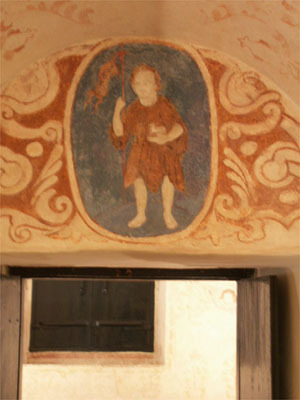 Frescoes were revealed in the chapel in 1998 (some sources say 1996), during "routine conservation work." The frescoes were likely done by Chinese artists under the direction of Portuguese priests, and so reflect an East-West idiom. We...ummm...kinda cheated, and snuck a few shots inside the (deconsecrated?) chapel. (I read thatthere is a service there once a year, but the place was pretty ripped up when we were there). 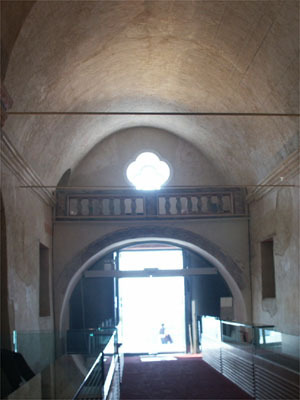 The first interior picture shows the vault of the nave leading back to the main door. You can just make out some of the frescoes on the ceiling.The other shows a figure of St. John the Baptist over a door inside a sidechapel. The entire area (and much of the city) is a UNESCO World Heritage Site.